In 1991, he began studying at the Faculty of Journalism Bucharest, working at the same time as a photographer for Nottara Theater and Today newspaper. Two years later, he became a student at the Academy of Theatre and Film, where he studied film photography. During 1997-1998 he was a professor in the same university. In the last 18 years, Bumbut worked as freelance photographer and his fashion stories and photo reportages were published in Elle, Esquire, Marie Claire, Tabu, Cosmopolitan, FHM, Dilema and Viva!. Cosmin Bumbut worked in advertising campaigns for Vodafone, Raiffeisen Bank, ING Bank, HVB Bank, Rompetrol, Procter&Gamble, I.D. Sarrieri, Wella, Epson, Coca-Cola Romania, Marriott Hotels, Romtelecom and Mercedes-Benz Romania. 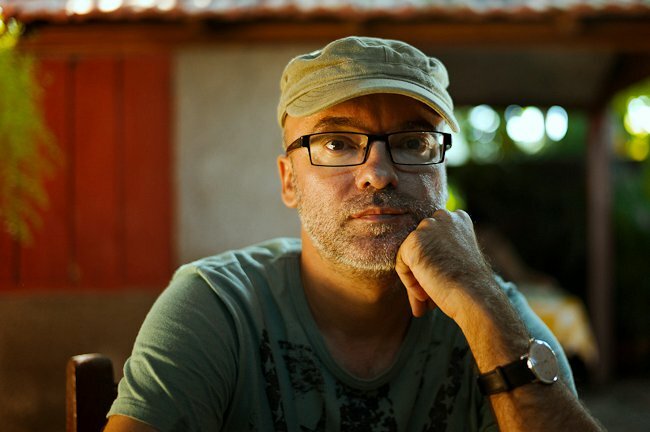 In 1999, he co-founded the photo group 7 Days (www.7zile.ro) and he organized a series of workshops and photo camps. In 2009, he launched the magazine Punctum (www.punctum.ro), dedicated to art photography. He was awarded The Best Fashion Photographer, Pantene Beauty Awards (2002), The Best Advertising Photo (Ad'Or Festival, 2001) and Best Advertising Photo (AdPrint Festival 1996). In 2006, he won the International Photography Award for a series of photographic portraits of convicts from Aiud Penitentiary. He was also awarded during International Competition for Print Advertising and Design (2002) and B&W Spider Awards (2006). Over the years, his photographs were exhibited in New York, Amsterdam, Fellbach, Luxembourg, Thessaloniki, Madrid, Rome, Warsaw or Naples. His photo album Transit (Humanitas, 2002) won the Art Book of the Year Award given by Romanian Publishers’ Association. He is also co-author of the photographic album 7 Zile – 7 Ani in Maramures (7 Days – 7 Years in Maramures, Humanitas, 2007). His photographs were also published in Intineraires d’une vie. E. M. Cioran, by Gabriel Liiceanu (Michalon, Paris, 1995), Outdoor lighting: Fashion & Glamour, by Cathy Joseph (Ava Publishing, Switzerland, 2003) and Lenswork nr. 50, Lenswork Publishing USA (2003). A inceput sa urmeze cursurile Facultatii de Jurnalism din Bucuresti in 1991, lucrind in acelasi timp ca fotograf pentru Teatrul Nottara si cotidianul Azi. In 1993, a devenit student la Academia de Teatru si Film, sectia Imagine de film si TV, pe care a absolvit-o in 1997. In perioada 1997-1998 a fost preparator in cadrul aceleiasi facultati. Bumbut lucreaza de 18 ani ca fotograf independent, iar fotoreportajele si pictorialele sale de moda au fost publicate in Elle, Marie Claire, Tabu, Cosmopolitan, FHM, Esquire, Dilema si Viva!. De asemenea, a facut fotografii pentru campaniile publicitare ale Vodafone, Raiffeisen Bank, ING Bank, HVB Bank, Rompetrol, Procter&Gamble, I.D. Sarrieri, Wella, Epson, Coca-Cola Romania, Marriott Hotels, Romtelecom si Mercedes-Benz Romania. In 1999 a infiintat, alaturi de Silviu Ghetie, grupul fotografic 7 Zile (www.7zile.ro) si a participat la mai multe ateliere si tabere foto in cadrul acestui grup. In 2009, a lansat revista de arta si cultura vizuala Punctum (www.punctum.ro). Printre premiile obtinute de Bumbut pina in prezent se numara Cel mai bun fotograf de moda, Pantene Beauty Awards (2002), Cea mai buna fotografie publicitara (Ad’Or Festival, 2001) si Cea mai buna fotografie publicitara (AdPrint Festival 1996). La nivel international, a fost premiat in cadrul International Competition for Print Advertising and Design (2002), B&W Spider Awards (2006) si International Photography Award (2006), distinctie acordata pentru o serie de portrete cu detinuti realizate in Penitenciarul Aiud. De-a lungul timpului, fotografiile sale au putut fi vazute in mai multe expozitii din tara si strainatate – New York, Amsterdam, Fellbach, Luxemburg, Salonic, Madrid, Roma, Varsovia sau Napoli. Este autorul albumului Transit (Humanitas, 2002), desemnat Cartea de Arta a Anului de Asociatia Editorilor Romani, si co-autor al proiectului 7 Zile – 7 Ani in Maramures (Humanitas, 2007). Fotografiile sale au mai fost publicate in Intineraires d’une vie. E. M. Cioran, de Gabriel Liiceanu (Michalon, Paris, 1995), Outdoor lighting: Fashion & Glamour, de Cathy Joseph (Ava Publishing, Elvetia, 2003) si Lenswork nr. 50, Lenswork Publishing SUA (2003).